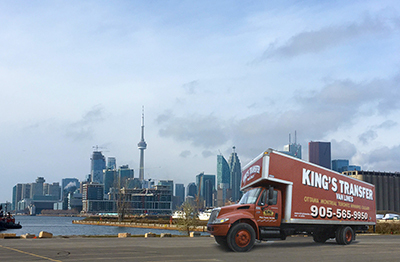 King’s Transfer Van Lines is your family owned & operated movers since 1922 - providing professional moving services from Mississauga to the United States. From Mississauga to anywhere to the USA including major cities like New York, Boston, Chicago, or Miami – King’s has the crew & equipment to get your move done safely & efficiently to your new home. We offer white glove moving & packing services, along with professional consultants that can assist you with all your customs & regulatory needs in preparation to entering the United States of America. All of your personal goods are actually cleared directly at the border upon entry. It is absolutely essential to have ALL required documentation on hand including passports and visas for all family members. Specific documentation is required for each land based crossing circumstance. This includes your personal belongings, newly acquired purchases, and importing of personal vehicles. We are long established members of the American Moving & Storage Association, Canadian Association of Movers, registered with the Better Business Bureau (A+ rating), and are a founding member of Atlas Van Lines Canada! Our partnership with Atlas Van Lines gives access to over 500 associated agencies that allow us to support your move anywhere in North America. A claim that few other associations can provide! We are specialists in crossborder moving! You can count on King’s Transfer Van Lines to bring you the best moving service with a team that is dedicated to your satisfaction, fully licensed, well-trained and courteous. We have the right experience and the right equipment for any moving job, no matter how big or small. We’re the “King of Movers ®” and we’re ready to help you with your move. The United States of America is Canada's top trading partner, boasting a total population of over 340 million. Flow of employees between the two countries is fluid as companies expand across the borders. Over $570 billion US dollars in trade takes place annually between the two countries that share the longest undefended border in the world. Over 40% of all oil imported into the US originates solely from Canada. Hydro electric exports supplying the eastern power grids of Maine, New York, New Hampshire, Vermont, and more. These are just a few points that make Canada an invaluable resource pool of natural resources & corporate talent to American industry. Opportunities galore present themselves to Canadians willing to relocate to the USA. We specialize in the world of corporate relocations, and can help you & your family to smoothly transition over to your next set of challenges! Moved on June 22 and everything was OK, paid extra because we ran later, so that was a bit off putting. Later when unpacking found that the TV had 2 scratches on it and the dining room table. Got the claims form and sent off. No reply. Emailed for updated, got a reply saying they are working on it. Month after that sent another email asking for update and got an out of office reply that the person was no longer with the company. Two more emails and it is coming up to 4 months later and no response. Not impressed. I paid a lot of money to hire the best and now have received NO customer service. When we first started planning on moving to Atlanta, it never occurred to us on how much is actually involved! Between the work visas, passports for all the kids, looking for a new house we simply forgot to factor something in all preparation: moving. My wife’s company was willing to handle everything, but we opted instead for a lump cash sum to do it ourselves. After attempting to research the information & contact government agencies (ooouf), it became apparent that things were starting to run a bit out of hand. We approached her company once more. They provided us contact information for Atlas Van Lines to handle the move. This was a life saver. They put us in contact with King’s Transfer who arranged EVERYTHING. This cannot be stressed. EVERYTHING.